Royal Worcester Time to Collect Ad 1972. Royal Worcester Time to Collect Ad 1972. This is February 1972 advertisement. This is a nice color ad from Royal Worcester of New York Shows a young couple standing on the beach and it reads, Suddenly it's time to collect something besides seashells. Royal Worcester is the romantic English bone china that lovers have been collecting since 175l. Shows five different patterns. In mint condition. Photo is taken through plastic and may show wrinkles or crookedness that is not in the ad. This magazine tear sheet measures 10"" wide by 13"" tall. 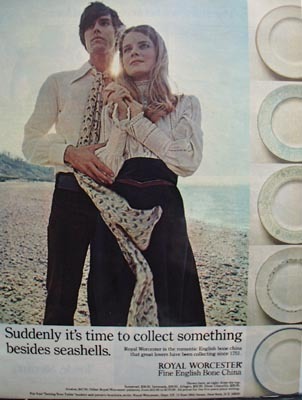 Items Similar To "Royal Worcester Time to Collect Ad 1972."